Yes, martial law happened to her. From the reactions of those who joined the fun run, the goals to simulate martial law and to get young people to “experience” its horrors have been achieved. The Great Lean Run was not the regular fun run. It was a reminder to today’s young people that life was not better during martial law. But how do you convey that message to those who have never felt the mortal fear and experience of arrest, detention, torture, and summary execution of friends under a dictatorship? What was it like to have no right to life, liberty, or property? The Samasa Alumni Association, a group of student activists from the 1970s onwards, organized The Great Lean Run Saturday, September 19, the 28th death anniversary of Lean Alejandro, a hero for many of the organizers. 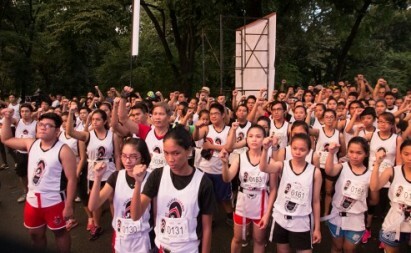 About 1,400 students and non-students joined the run organized to raise funds to build a Lean Alejandro memorial inside the UP campus in Diliman. What was martial law like? The Great Lean Run simulated life under martial law: Metropolitan Command (the police group at the time) chased demonstrators (the runners), grabbing their rights (to life, liberty, and property) ribbons; water cannons from fire trucks hosed down protesters because getting together with two other friends meant illegal assembly; and rally-goers avoided the barbed wires. And to relive the experiences of those who escaped jail for fighting against the corruption and excesses of the Marcos dictatorship, the runners had to climb a wall, cross a creek, and crawl through mud. Before running, the participants went through a warm-up exercise and recited a pledge to fight against a return to a dictatorship. And, near the end of the run, “ang mga anak ng bayan (people’s children)” had their red-blood palm prints taken to represent their “panata (vow)” to fight all forms of oppression. 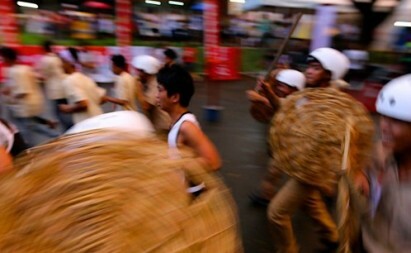 What are the lessons of martial law? Middle-aged activists brought their children and ran with them. Dom Danao and Amor Datinguinoo took their teenage daughter Teresa, who gestured “mind-blowing” at the AS Steps, where Abdulmari “Toym” Imao set up his installation of the disappeared. The entire family ran in the dark and “suffered” the course around the University Oval. They all proudly showed off the marks of blood, sweat, and mud they suffered — surviving martial law with a lot of struggle. The Great Lean Run participants included students who were not from UP. Pulido had asked his law students from Arellano University to take part in the event. “These days, young people are far removed from those dark times — and that’s a good thing! But remembering what went on before is key to ensuring that it never happens again,” said Laarni Giron on her Facebook page. “The death anniversary of our student leader Lean Alejandro, murdered in broad daylight by forces of the state, is a time of remembering and reliving the evils of martial law, the brutality of authoritarian rule, but most of all, the steadfastness of those who rejected it,” said another activist, Cynthia Allanigue, on her Facebook page. Alejandro, who was killed in an ambush during the turbulent early post-Marcos years, was the UP Student Council chairman in 1983. He later left the university to become a leader initially of youth and student groups that flourished at the height of military rule; he later joined national people’s organizations that included workers, farmers, women, indigenous people, and other marginalized sectors of society. Lean, as he is known, ran and lost to cheating in the first elections organized after the dictator was kicked out of the country in the historic EDSA People Power Revolt of 1986. Despite the overwhelming support from regular folk, he lost the election for congressional district representative of Malabon-Navotas; tricycle drivers organized a mass action at Mendiola to protest his defeat. Lean was killed shortly after he returned to civil society to continue the fight against military elements who were bent on wresting control from the new government under the late President Corazon Aquino, mother of the current president. Labor leader Rolando “Ka Lando” Olalia was also killed during this time of power struggle. Samasa members abroad organized their own versions of the run in Jakarta, Bangkok, Tokyo, Geneva, Siem Reap, California, Brooklyn in New York, Connecticut, and Texas. There was also a parallel run in Mindanao. According to Samasa member lawyer Dennis Gorecho, UP Chancellor Michael Tan wants the event to be an annual “inter-generational” activity and dialogue.